Your choice to buy organic pollinator plants from a local farmer and your willingness to grow bee friendly plants helps to maintain a healthy environment, vibrant community, and a strong local economy. If dandalions are blooming at the same time as the apple trees, the honeybee will select the nectar that the colony prefers and will fully exhaust that nectar source before moving on. It is advantageous then, to cultivate one crop and plant it en mass. Workers will favor the plants that are closest to the colony. Single blossoms with anther and stamen easily accessed within the petal are better than double or trumpeted blossoms since the honeybee’s proboscis is not very long. 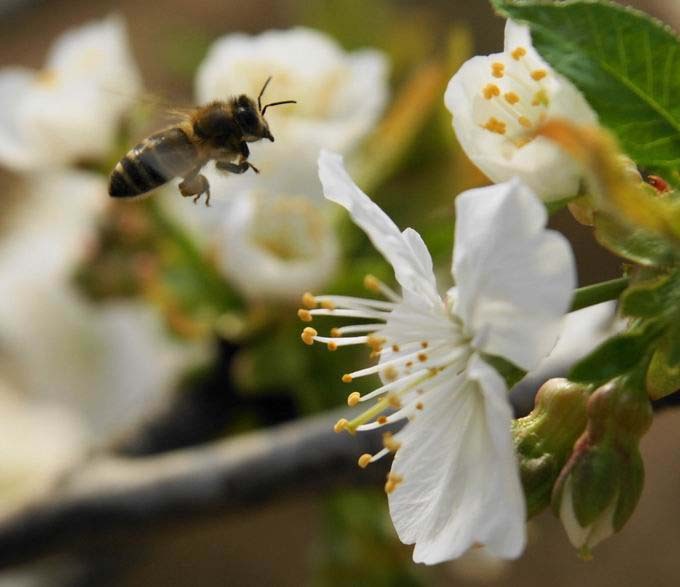 Bees will pollinate plants that are not native to an area but are inefficient pollinating non-native plants. It is important to select plants that are local. Listed below are plants that honey bees will pollinate effectively. Not all of these plants grow in every location. According to the USDA, Washington Island is in zone 5A. When selecting plants the farm uses zone 4. Find your own zone at the National Gardening Association. If you see a plant not listed in our database below, and it is a bee friendly plant, send us the plant name so that we can build a comprehensive database. (add a plant here).